It’s nigh impossible to imagine now, but yes, there was a time when a Lightning Bolt performance did not immediately mean pure frenzy. In 2004, the noise/punk-rock duo played their very first concert while attending the Rhode Island School of Design in Providence, R.I., the city that still serves as the home base of drummer/ vocalist Brian Chippendale and bassist Brian Gibson. Chippendale recalls stray details of the inaugural show—a TV displaying red static sat in front of the bass drum for lighting, a Walkman played a noise loop to supplement the band, the set consisted of three songs played to maybe a dozen friends—but by and large, it was remarkably unremarkable. Since then, Lightning Bolt’s reputation as a preeminent live outfit has been their most attractive trait. The pair immerses themselves in blaring volumes, high-speed playing—Chippendale is a particularly savage presence, thrashing away at his kit and screeching through the mic lodged in his homemade mask—and the audiences themselves. More often than not, an opportunity to witness the group in person means focusing your attention on happenings on the floor rather than the stage, as they are fond of swiftly setting up right in the center in a room. 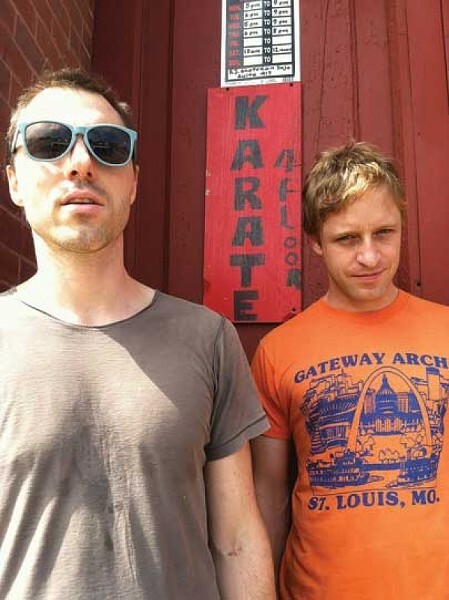 This taste for “guerrilla gigs” has informed Lightning Bolt outside of conventional music spaces, too, with the band playing on terrain such as sidewalks and parking lots. At the outset, the party-friendly band’s preference for playing within crowds was rooted in pragmatic purpose—they felt physically removed from their peers when onstage and moved closer to close the gap—but over time, Chippendale has realized other pleasures, too. That same juxtaposition between fun and danger runs deep within the group’s sound on record. A Lightning Bolt record is a barrage of elements—jangly, distortion-soaked bass lines, cymbals making clatter that’s the best kind of amateurish, unintelligible lyrics propelled from the bottom of Chippendale’s chest—that ultimately sound coherent through sheer force of will. There’s something profoundly, wonderfully naive about how committed the band members are to banging out their songs and engaging audiences, but also something sinister about the unruly nature of their sound and how sincerely they are compelled to maintain such aggression show after show.